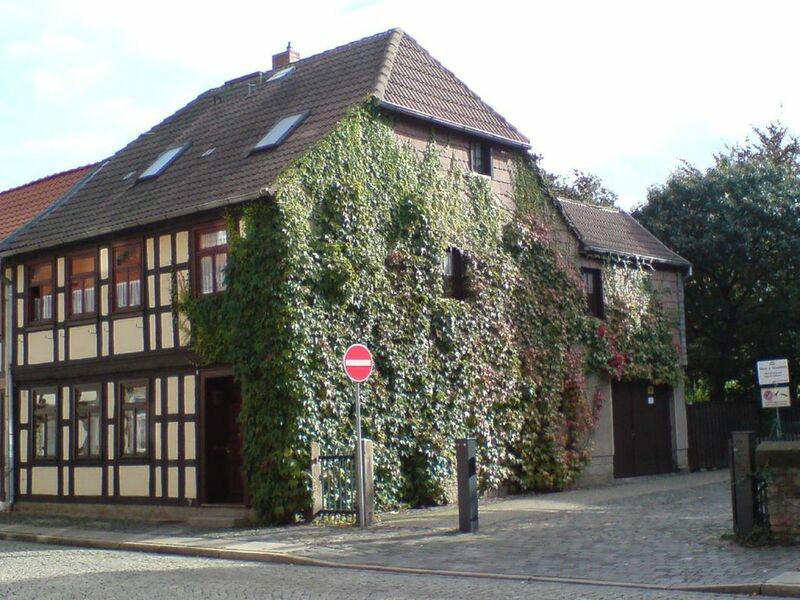 Cozy apartment directly in ground floor in our central but quiet historic timbered house next to the oldest church in Wernigerode with room for max. 3 adults. The combined living room and bedroom is tastefully furnished and offers next to a new furniture as a visual highlight and a old painted cabinet from the 18th century. The windows facing the street can be additionally closed with shutters that can be operated from the inside. The kitchen is also newly furnished and offers in addition to a complete kitchen equipment with gas stove, oven, microwave, fridge and freezer many other useful details. In the modern bathroom with shower, toilet, mirror cabinet and hair dryer is also a washing machine available. The apartment is located on the ground floor of a renovated, for the Wernigerode downtown typical historic half-timbered house (first mentioned in 1658). It has been extensively renovated and lovingly furnished, so that your stay in it will be a pleasant experience. A noteworthy "neighboring house" is the St. Johannis Church with a Romanesque tower, Wernigerode's oldest church. In about 10 minutes you reach the Breite Strasse, which is also the architecturally interesting shopping mile of Wernigerode. In about 15 minutes from the apartment you can reach the beautiful 500-year-old town hall, the interesting market square or the relaxing forest. Please note that this holiday apartment is not suitable for the disabled. Final cleaning: once per object Costs amounting to 36 EUR (Mandatory). Internet: per object and day Costs amounting to 1 EUR (optional). Visitor's tax: per person and day Costs amounting to 2.8 EUR (Mandatory). Alles da, was man braucht, ruhig gelegen, obwohl Nähe Altstadt und daher alles zu Fuß erreichbar, liebevoll eingerichtet. Einziger Schade-Punkt: Keine Terrasse. Ansonsten gerne weiter zu empfehlen.